I hope that all my readers had a very, Merry Christmas yesterday! My husband and I went to Pittsburgh to visit with my family which was really nice. Now that Christmas is over, it’s on to the next holiday…New Year’s Eve! I think New Year’s Eve is one of the best holidays because basically it’s all about hanging out with friends and eating. I’m always one who makes a lot of appetizers for New Year’s Eve whether we host a party or it’s just the two of us. I think it’s fun to have a little bit of everything while waiting for midnight. When I was younger I would go out on New Year’s Eve but now that I’m older and usually in bed by 10, it’s harder for me to stay up until midnight so we usually find ourselves at our own house or the house of our friends. This year we had a holiday party before Christmas so I was able to try out several new appetizers. One of my favorites was a twist on the classic bruschetta. I have a bruschetta recipe that I absolutely love and use often, but sometimes it’s fun to shake up a favorite recipe. 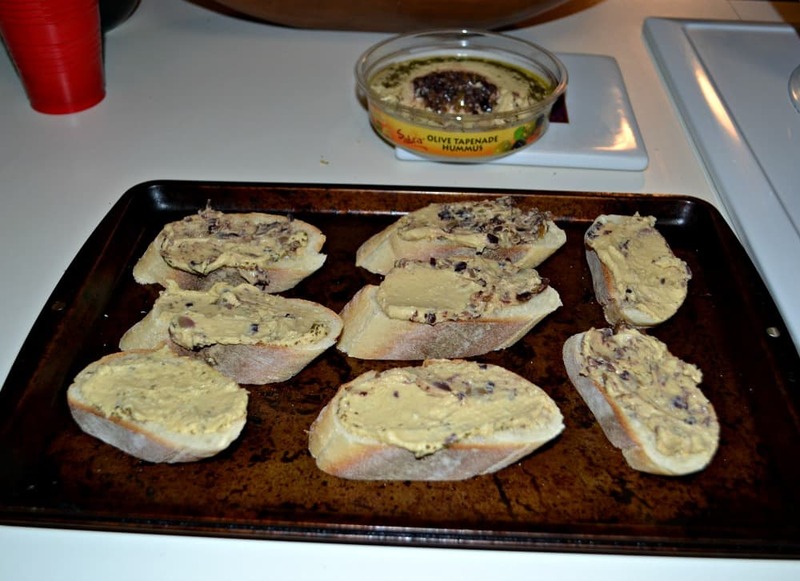 I spread Sabra Olive Tapenade Hummus on top of crostini. Then I made my traditional bruschetta topping and piled it high on top of the hummus. 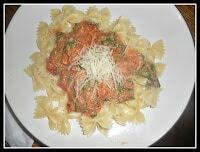 Finally I finished it off with some crumbled feta cheese and a sprinkle of oregano. I toasted it in the oven for 7 minutes or so and when it came out it smelled awesome. The feta cheese just slightly melts and gets a little brown. The crostini gets crispy which allows it to hold up well to all the toppings. It has a great flavor too. It’s got a Mediterranean feel with the olive hummus, feta, and tomatoes. These hummus bruschetta crostini were a big hit at our holiday party and I’m sure they will be a hit at yours too! 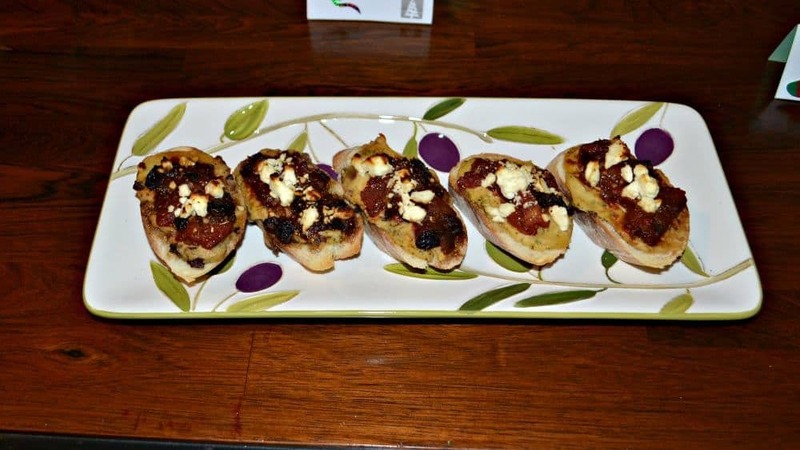 Crostini topped with Sabra Olive Tapenade Hummus, bruschetta, and feta cheese. In a large bowl combine the tomatoes, diced sun-dried tomatoes, garlic, and olive oil. Slowly mix in the vinegar. Stir in the oregano, salt, and pepper. Cut the baguette into ½ inch pieces and place on a baking sheet. 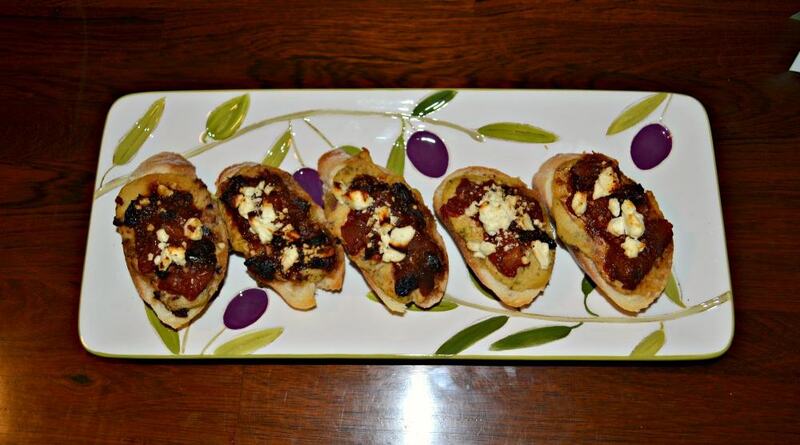 Top each crostini with 1 tablespoon of Sabra hummus, 1 tablespoon of bruschetta and then sprinkle with feta cheese. Bake for 6-8 minutes or until the crostini is crispy and the cheese is starting to brown. I am a Sabra Tastemaker and have received compensation for my work. All opinions are 100% my own. I’m going to be honest – I’ve never tried Hummus, but this looks great. I may have to give it a try! I have introduced a lot of my friends to hummus and all but one have really liked it! I don’t eat hummus but this does look good. Hummus is not my favorite food in the world but I do enjoy it on occasion. I think eating it the way you made it would make me enjoy it more. It’s a great base for the bruschetta. My friend introduced me to hummus over the summer. I’ve tried the red pepper hummus, but I’d love to try some garlic hummus and this recipe looks great! I love hummus and I love bruschetta, can’t wait to try this combo. Sabra is one of my favorite brands of hummus to use. I love how you turned a basic hummus into a tasty bruschetta. Great appetizer! I’m sure I would really like these! 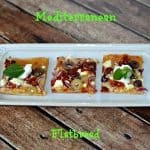 Love bruschetta, feta, and hummus! 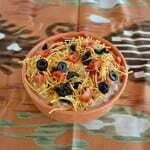 It’s a really simple but delicious appetizer. 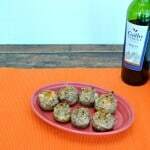 Those look perfect for an appetizer on New Years Eve! I absolutely love Hummus and this sounds like a great snack!